Psalm 138 begins the sixth section of the fifth book of the Psalter. This section contains eight psalms of David, which contain both praise and intense prayer for help. These psalms, as a recapitulation of redemptive history, point to a restored and blessed kingship. This king still struggles – the new Heaven and new Earth have not yet arrived – but he is blessed by the Lord and praises him: “On the glorious splendor of your majesty, and on your wondrous works, I will meditate. They shall speak of the might of your awesome deeds, and I will declare your greatness. The Lord is gracious and merciful, slow to anger and abounding in steadfast love,” (Psalm 145:5-6, 8). All eight of these psalms in some sense offer David’s answer to the problems posed by Psalm 137. Psalm 137 is a lament of exiles from the Land of Promise who have been carried away to Babylon. It is the saddest psalm of the fifth book. It asks the haunting question: “How shall we sing the Lord’s song in a foreign land?” (v. 4). This question summarizes the crisis of faith we found in Book Three. 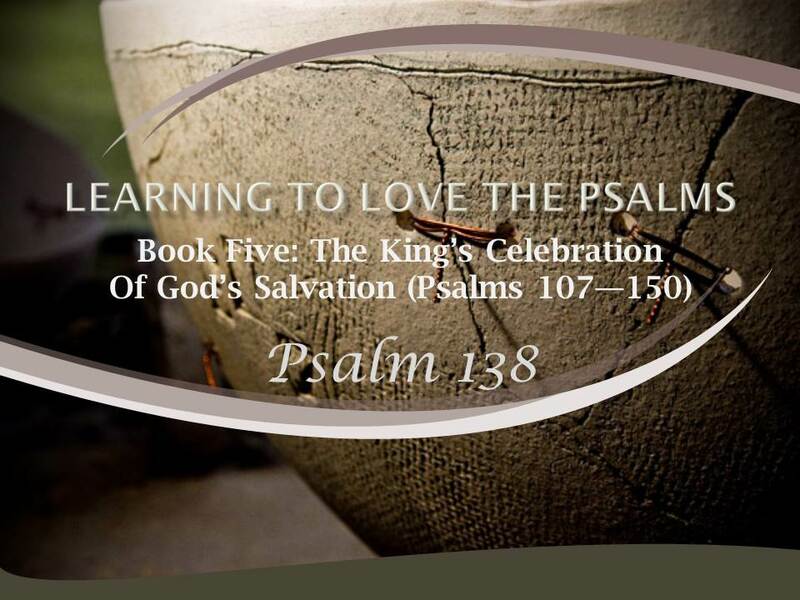 These last psalms of David, the psalms of a restored kingship, answer the crisis of Book Three and the question of Psalm 137. Psalm 138 begins to answer the lament of Psalm 137 with praise and assurances of the victory of God’s people over their enemies. At the heart of this psalm is the confidence of David: “Great is the glory of the Lord,” (v. 5b). This assurance is the ultimate answer to every question and struggle. The glorious God of Israel will overcome every trouble for his people. And in all his works, he further displays his glory. David has experienced this glory very personally. The psalm opens with his declaration that he will praise the Lord with all his heart. This devoted praise will be before the gods of the nations, (v. 1). These gods and their nations are ultimately as nothing before the greatness of Israel’s God. Here is part of the answer to the lament of Psalm 137: The gods, however apparently strong or successful, do not compare to the true God. The psalmist then speaks of worshiping in the temple of the living God, (v. 2). He bows in humble adoration, reflecting on the love and faithfulness of his God. The covenant love and faithful promises of God sustain David even in trouble. Here is perhaps an echo of Psalm 73 and the encouragement that the psalmist derived there from entering the temple. Here, too, is a restored, true temple that the Babylonians and other enemies of God can never destroy. David’s confidence in the faithfulness of God rests upon God’s Word. He declares, “For you have exalted above all things your name and your word,” (v. 2b). This assertion is strong, but not surprising. The psalms regularly exalt the Word. But here, the literal words of the testimony are remarkably strong – so strong that the translators have offered a variety of renderings. In addition to the translation of the ESV cited above, some have suggested that with a change in one consonant in the Hebrew text, it should read, “You have exalted your word above all the heavens.” John Calvin suggested that with a change in one vowel, it would read, “You have exalted your name above all things by your word.” The Hebrew as it stands, however, says quite clearly, “You have exalted your word above all your name.” Many translators cannot imagine that David said that the Word of God is above the name of God. But is such a statement so strange? David is making the point that he knows the love and faithfulness of God from his Word. Without the utter reliability of the Word, we would not know the name or character of God. God’s revelation of himself in the scriptures is the basis for our confidence in God’s care for us. This reliable God is a God who hears and answers prayer: “On the day I called, you answered me; my strength of soul you increased,” (v. 3). Here is great encouragement for those who are suffering and lamenting. God hears our cries of distress and will answer. He will vindicate his ways and his people. He will make his people as courageous as David was. We do not need to be fearful, for God will deliver us. The very personal praise of David for what he has experienced will one day be the praise of the rulers of this world. “All the kings of the Earth shall give you thanks, O Lord, for they have heard the words of your mouth, and they shall sing of the ways of the Lord,” (vv.4-5a). A great day of worldwide blessing is coming. Babylon’s victory, which we see in Psalm 137, is only temporary. God is the final victor. We as Christians see that victory in the worldwide spread of the gospel. The word spoken by the Lord about the apostle Paul has been fulfilled and is still being fulfilled: “He is a chosen instrument of mine to carry my name before the Gentiles and kings and the children of Israel,” (Acts 9:15). As we have seen before, the kings and nations that will serve the Lord will be his, but those who reject him will be condemned. David reminds us that the times of trouble and humiliation are not signs that the Lord has forgotten. “For though the Lord is high, he regards the lowly, but the haughty he knows from afar. Though I walk in the midst of trouble, you preserve my life,” (vv. 6-7a). This promise is true for all of God’s people, but it comes to special focus in the experience of Jesus Christ. He was on high but became lowly for our sakes. He taught humility and exemplified it. It was not the proud and strong he saved, but the weak and lowly. Though he walked through the trouble of the cross, the Lord did at last preserve his life so that he became the life-giving one. The Lord will come in judgment against his enemies: “You stretch out your hand against the wrath of my enemies, and your right hand delivers me,” (v. 7b). This word of judgment perhaps answers the terrible prayer at the end of Psalm 137. Psalm 137 closes with a strong imprecation against Babylon that shows the exiles longing for a day of deliverance: “O Daughter of Babylon, doomed to be destroyed, blessed shall he be who repays you with what you have done to us! Blessed shall he be who takes your little ones and dashes them against the rock,” (vv. 8-9). This imprecation is indeed horrifying and is meant to show how terrible the judgment on Babylon will be. Without meaning to diminish the horror of killing children in any way, we need to recognize that such actions were a standard part of ancient warfare. For example, Elisha described the result of defeat in speaking to Hazael: “You will set on fire their fortresses, and you will kill their young men with the sword and dash in pieces their little ones and rip open pregnant women,” (2 Kings 8:12b), Jeremiah prophesied complete destruction for Babylon, (Jeremiah 50:51), and Isaiah specifically prophesied the destruction of their children: “Their infants will be dashed to pieces before their eyes,” (Isaiah 13:16). The Babylonians would receive recompense for what they had done to others. This violence was the awful reality of war, as even Jesus recognized when he wept over Jerusalem: “Your enemies will tear you down to the ground, you and your children within you,” (Luke 19:44). Psalm 138 assures God’s people that a just judgment is coming and we must not close our eyes to the dreadful reality of what judgment will mean. Psalm 138 closes with a wonderful word of strength and support for those who were feeling forlorn: “The Lord will fulfill his purpose for me; your steadfast love, O Lord, endures forever. Do not forsake the work of your hands,” (v. 8). As his love is everlasting, so God’s king, our Jesus, knows that God will not stop loving him. The God who from all eternity had his plan of redemption through his king will fulfill that plan. All who are part of the true king’s kingdom will share in his blessing and glory. Here is the foundation of our confidence. Our God has a plan and in his greatness he will fulfill it in Christ. How does Psalm 138 begin to answer the lament of Psalm 137 with praise and assurances of the victory of God’s people over their enemies? How do we know that David’s confidence in the faithfulness of God rests upon God’s Word? Is it comforting or concerning that the Lord will come in judgment against his enemies? Explain. In what ways does David remind us in this psalm that times of trouble and humiliation are not signs that the Lord has forgotten us? What reminders or promises do you look to in the midst of feeling that the Lord has forgotten about you?